In December 1954, Jonas Mekas and his brother Adolfas published the first issue of Film Culture magazine. Initially hostile to American avant-garde filmmaking, the magazine eventually evolved into the avant-garde’s greatest champion in print. Sources vary on the publication date of the first issue, with some placing it in 1955, and others in 1954. While the cover carries a publication date of January 1955, in an interview with Amy Taubin, Jonas clearly states that the first issue was published in December 1954. You can watch the interview with Jonas where he states this below. There are also articles by Gordon Hendricks, Francis Bolen, Roger Tilton, Jose Clemente, Richard Kraft and others. It is known that the film industry has produced fascinating works, full of inventiveness, inspiration, and human values. The problem with which we are dealing here is the film as an original art form. Good and bad have no meaning as long as it is not clear upon what aesthetic fundamentals the film is supposed to be built. Hans Richter, it should be noted, was not only an accomplished European avant-garde filmmaker who had moved to the United States, but also taught both Jonas and Adolfas Mekas at the Film Institute of City College of New York. In the interview below, Jonas relates a story in which George Fenin, who served on Film Culture‘s editorial board, allowed Mekas to host a launch party for the magazine at the prestigious Waldorf Astoria in NYC. Fenin was also President of the Foreign Correspondents Association, which owned a room in the hotel where the organization held meetings. At the party, the Mekas brothers hit up attendees to help support the magazine. 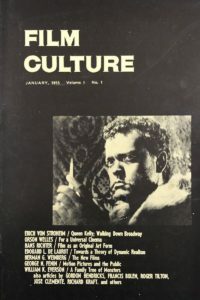 Film Culture would publish 79 issues between 1954 and 1996. In 2018, an 80th issue was published subtitled “The Legend of Barbara Rubin” and is part of the project Edit Film Culture!. Buy Film Culture 80 on Amazon!